These days, most people have tried various smartphone or tablet games – after all, games are the single biggest category of apps; games take up over 20% of the Apple App Store. 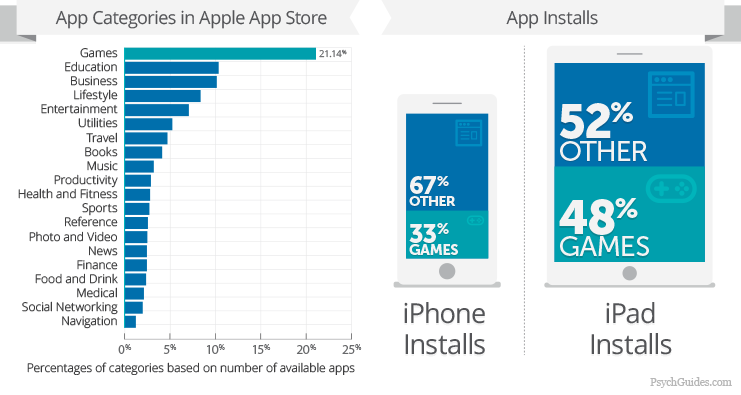 They’re also the most popular, comprising 33% of iPhone downloads and 48% of iPad installs. And you probably know a few folks who are so lost in Temple Run or Bubble Witch Saga that they just can’t seem to put it down. Mobile games are more popular than ever, and they’ve also become massively profitable. 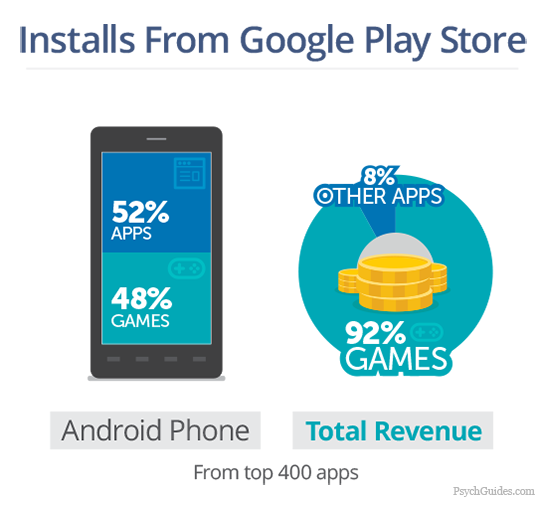 While only 48% of the top 400 apps on Google Play are games, these apps brought in 92% of total revenue. Perhaps most surprisingly, 92% of revenue in the Apple App Store ecosystem comes from in-app purchases, rather than purchases of paid apps. How can companies turn such a profit on free games? Since the advent of in-app purchases on iOS in 2009, game developers have found new ways of generating more and more revenue from players. A recent “South Park” episode poked fun at “freemium” games – apps that are free to download but include an option to pay to unlock new features or progress further in the game. Think of it as the standard, deluxe, or ultimate collector’s editions of popular console games, just with another tier added: free. The economy of it is simple enough – lowering an app’s price to zero can lead many more people to install it since it costs nothing to start playing. But freemium games aren’t simply on par with their paid counterparts – these free apps have far surpassed them. 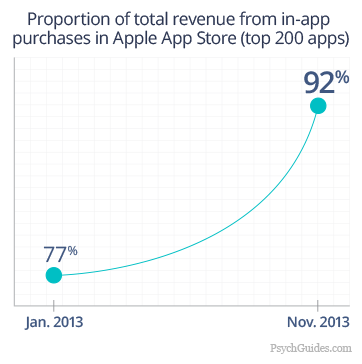 In 2013 alone, in-app purchases’ share of the Apple App Store’s total revenue from the top 200 apps grew from 77% to 92%. It’s somewhat unexpected that free games would actually be more profitable than paid games, but when we look at patterns of how users make purchases within these games, the numbers start to add up. A 2014 study of freemium mobile games found that 67% of in-app purchases were between $1 and $5, but these purchases only made up 27% of total revenue, while 9% of revenue was from purchases of $50 or more. Overall, 50% of mobile gaming revenue came from the top 10% of mobile gamers making purchases. 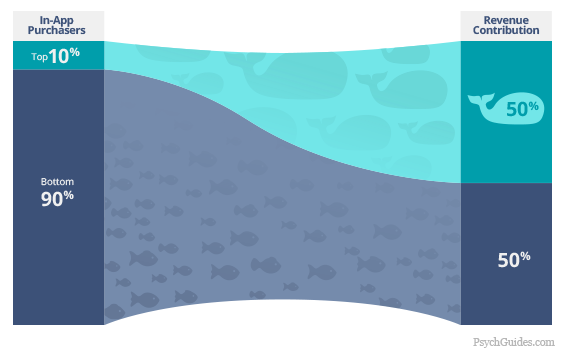 These heavy spenders, termed “whales,” have been directly compared to the “big fish” courted by casinos. To generate vast profits, freemium games don’t have to hook everyone; instead, they only need to attract a small fraction of diehard fans. What could possibly motivate users to spend $30 or $50 at a time on a free smartphone game? Game developers have learned to make their apps as appealing as possible by directly exploiting the mechanism of addiction. 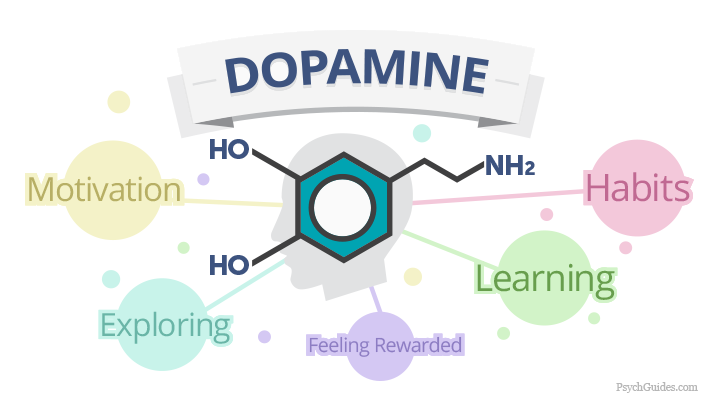 Habit formation is inseparable from the workings of dopamine in the brain, a neurotransmitter that’s tied to learning, exploring, seeking out novelty, and feelings of being rewarded. Drugs that increase dopamine levels to treat Parkinson’s disease were found to have unexpected side effects and, in some cases, have elicited compulsive gambling behavior. Other drugs that modulate dopamine work in the opposite direction, rendering their effects useful as an aid to quit smoking. Depending on the direction of the change, manipulating levels of dopamine can either reduce feelings of reward – or kick them into high gear. Studies have found that playing video games can increase dopamine levels and that these levels were highest among those who were the best at these games. And designers of mobile games have worked to influence dopamine any way they can. Smartphones have sometimes been called “the world’s smallest slot machines,” and game developers seem to have taken that as a challenge. As technology observer Tom Chatfield explained in his 2010 TED talk, companies have worked to perfect the game mechanics that keep people coming back for more. On the surface, most smartphone games are simple – designed for a quick play when a user has a few minutes to spare and not hours-long marathons. Goals, like merely clicking on various in-game items, seem like they would become boring quickly. So how do we explain their ongoing appeal? That’s where designers take advantage of one of dopamine’s key functions: its encouragement of novelty-seeking behavior. Developers know that a completely predictable game is no fun to play, and that’s why they make their games unpredictable. 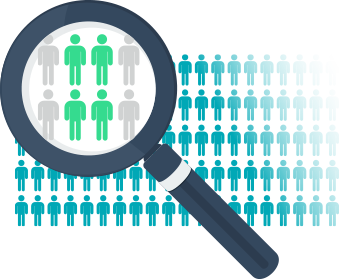 For users, uncovering certain items might have a certain expected reward most of the time – but a small fraction of the time, it could be a slightly bigger reward or even a very large one. Users won’t know when to expect these challenges because they’re randomly generated – but they know they’ll find one eventually if they keep playing. In psychology, this is known as a variable ratio reinforcement schedule, the very same process that keeps people sitting in front of slot machines all day. These game designers don’t just guess at the challenges they create, either. With millions of users, they have enough data on gameplay that they can pinpoint precisely when players are about to become bored and issue new items and challenges at just the right moment. 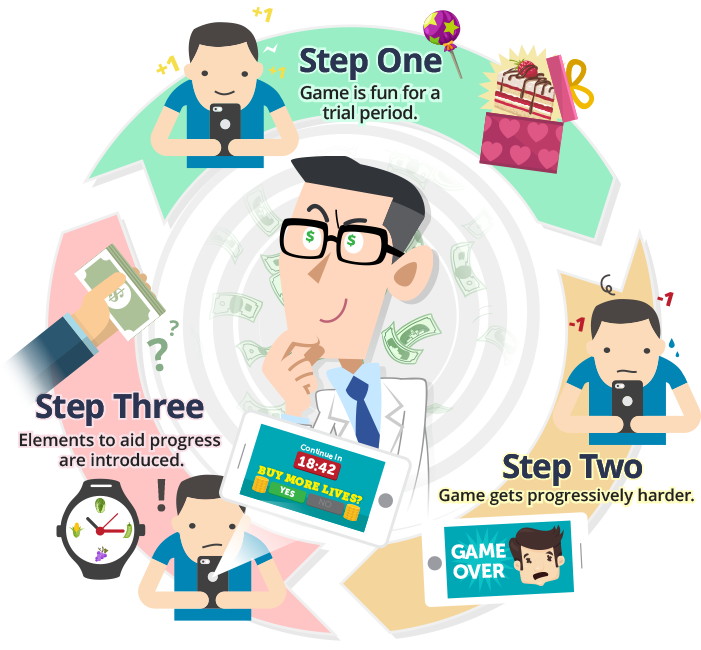 By using this aggregation of users’ gaming habits, they know exactly how to keep them playing as long as possible. It’s like looking inside players’ heads and crafting the perfect drug for them. Most people would find it hard to believe that fun little mobile games could be the catalyst for mass addiction. But one only needs to look at the bottom line. The Apple App Store now makes 90% of their revenue from freemium games, but only 10% from paid games. The makers of the free game Candy Crush Saga made $1.88 billion in revenue in 2013, and the company has stated that only 4% of its users have made purchases through the game. These users, on average, have each paid over $150 while playing. Considered together, the revenue of the world’s 15 biggest mobile game developers grew to over $13 billion in 2013. These developers now have a billion-dollar reason to experiment on countless volunteers, study their behavior to design more absorbing games, and make use of the same basic mechanisms that form the foundation of any other addiction. It’s the drug of choice for a digital age, and the first hit is always free. Feel free to share the images found on this page. When doing so, please attribute the creators of this project by linking back to PsychGuides.com and this page so your readers can learn more about this research and have access to any additional assets. Addiction to video games – including those designed around a “freemium” model– is an increasingly recognized and very real phenomenon. Knowing the signs of a burgeoning video game addiction in yourself or a loved one can be an important first step towards getting help. Call our toll-free hotline at – speak to a qualified support specialist to hear about available treatment options.